I worked as a photographer for decades, but for some years now, Benedetta and I have been working with essential oils. Only some plants are capable of producing these oils. Scented plants usually produce a good volume of oil, but the opposite is true for many plants that have a really powerful scent—they only produce a small or very small amount of essential oil, or even none at all. This is the case of lemon balm, which produces a very small quantity; of jasmine and rose, which produce even less; and of broom, which produces none. Each oil extracted from a certain plant is a blend consisting of hundreds of different molecules. All together, these molecules generate the aroma typical of that particular aromatic plant. Each molecule is an active principle, that will be more or less important depending on its percentage over the total. 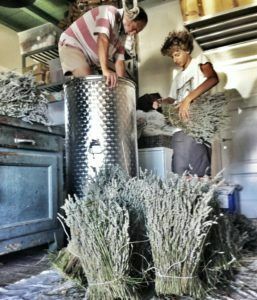 Essential oils can be extracted in a multitude of different ways, however we only utilize steam-distillation, the most ancient methodology, which dates back to Avicenna (about 1000 AD). A boiler full of water — which in our case comes from the aqueduct— is heated over a naked fire. When water boils, it turns to steam that flows into a steel container full of fresh plant material. The steam passes through the container and carries the essential oil into a condenser cooled by a chilled water coil. Here, the steam condenses and becomes distilled water, and then falls into another container where, due to the difference in density, the essential oil separates from the distilled water (which is now able to be called aromatic water or hydrosol). The aromatic water contains all of the water-soluble components found in the plant material, and a certain amount (up to 1%) of essential oil. Some oils have a remarkably different density than the aromatic water, and thus, separate more easily; others don’t have such a great disparity, like all varieties of thyme, and are ‘less enthusiastic’ about separating from the water, the glass used in distillation, and the steel walls of their container. So some oil is lost—and our total production is already small! In books and other texts, I often read of absolutely ridiculous “yields” (which refers to the amount of oil produced with 100 kg of plant material), which, to me, are almost always highly questionable because the yields claimed are too high. In my experience, yields are almost always low, often really low. All varieties of thyme, helichrysum, hyssop, and winter savory produce extremely small quantities, and that is why these oils are expensive. In theory, it is all very easy. In practice, it is not. Proper distillation practice relies on working out the correct proportions in many aspects of the distillation process. For example: how big should the boiler be compared to the volume of plant material? How much water, flame, and time do we need? To what extent should we press the plant material in the distillation still? How large should the distillation still be? 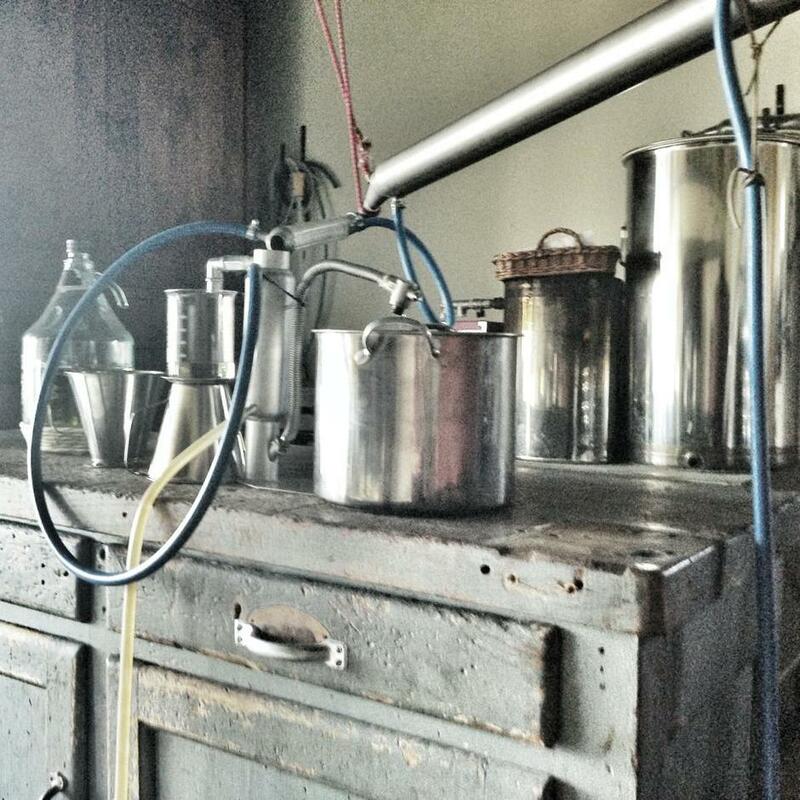 The answers to these questions varies upon which plant we are distilling. For these reasons, the harvest is a highly pivotal moment. The oil may be extracted form the different parts of the plants basically all year long, but it’s never uniform. It constantly changes in quality and quantity, especially during the flowering period when the quality of the oil changes from one week to the next. We have learned all of this through first-hand experience. The oil produced is influenced by the sun, by the volume of rain, by moon rhythms, air humidity, and of course the plant we use. So, it is of imperative importance for us to constantly observe our crops and for us to ably adapt to weather variability, which is totally unruly by definition. You need to know how to make decisions. Exactly like taking a photograph. You need to know how to make choices. Exactly like taking a photograph.